A 30-minute (37 kilometers) drive from Kuching brings us to a Malaysian village built on stilts over the river: Kampung Bako. Another 25 minutes boat ride out in the South China Sea to reach this coastal park. The park HQ is at Telok Assam but from the coast you would never know as it�s totally hidden behind trees. First time visitors are often confused when the boat suddenly turns towards the shore on what appears to be a collision course with the dense mangroves. But the skilled boatmen head for a narrow channel that leads to the small jetty at the HQ. From the moment you step off the boat it�s quite clear that Bako is a protected area. For a start the wooden chalets and resthouses are surrounded by virgin jungle, and what�smore, wildlife is everywhere. Almost every type of vegetation in Borneo is found here - 25 distinct types of vegetation form seven complete ecosystems from beach vegetation and mangrove forest to dipterocarp rainforest. The constant erosion over millions of years, had turned Bako into a picturesque coastline of steep cliffs, rocky head-lands and many stretches of sandy bays. The erosion caused by constant waves at the base of cliffs had carved and created many of the rocks into sea arches and sea stacks. Beautiful sandstone formation featuring pink and iron patterns on cliff faces can be seen along most of the coastline. Within the Park, it is not uncommon to see troops of long-tailed Macaques and silver-leaf monkeys along with giant monitor lizards, plantain squirrels, wild boars and mouse deers. The most significant animal in the Park is the bizarre long nosed proboscis monkeys found only in Borneo island. Right: Proboscis Monkeys - Th local Malays call it Monyet Belanda, which means Dutchman monkey, as a joke on European traders and colonials. Both were hairy, had big red noses and pot bellies! Their nose is so distracting that we often miss out how colourful they are: contrasting with their warm red-brown coats, they have a creamy chest, with long grey gloves and stockings and long white tails. They may have orange shoulders and a little cap of darker red fur. Proboscis monkeys generally live in groups composed of one adult male, some adult females and their offspring. There are some individuals that are solitary, most of which are males. Monkey groups leave in home ranges that overlap and there is little territoriality. Proboscis monkeys live in a fission-fusion society, with groups gathering at sleeping sites as night falls. There exist bands which arise when groups come together and sleep apart. Groups gather during the day and travel together, but individuals only groom and play with those in their own group. One-male groups consist of 9-19 individuals while bands can consist of as many as 60 individuals. Only in mangrove swamps or forests along rivers. The Proboscis eats mainly leaves (95% of their diet). It favours dipterocarp, mangrove and riverine forests. It can also be found in swamp forests, stunted swamp forests, rubber forests, rubber plantations, limestone hill forests, nipa swamps, nibong swamps, and tall swamp forests, tropical heath forests and steep cliffs. This species usually stays at least a kilometer from a water source. It is perhaps the most aquatic of the primates and is a fairly good swimmer, capable of swimming up to 20m (65.6 ft) underwater. It is known to swim across rivers. Aside from this, the proboscis monkey is largely arboreal and moves quadrupedally and by leaps. It is known to jump off branches and descend into water. In 1977, there were about 6,400 of them in Sarawak, but now there are only about 1,000, with perhaps another 2,000 in Sabah and 4,000 in Kalimantan. The male averages 24kg in weight, twice as much as the female. They're called Monyet Belanda in Malay - it means Holland (Dutch) Monkey, presumably because the Dutch have big noses compared to people in Borneo. The population is fragmented: the largest remaining populations are found in Kalimantan; there are far fewer in Sarawak, Brunei and Sabah. 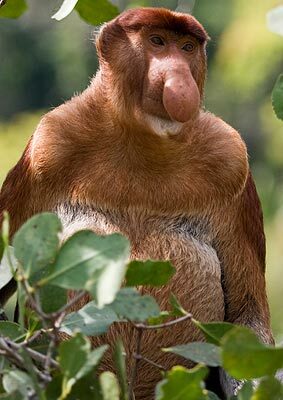 The proboscis monkey is protected by law in all regions of Borneo. In Malaysia, it is protected by a number of laws including the Wildlife Protection Act (federal law), the Wildlife Protection Ordinance 1998 (Chapter 26) and Wildlife Conservation Enactment 1997 (Sabah state law). Swimming, beach combing at low tide and sunset watching are popular activities along the sandy bays of the Park. 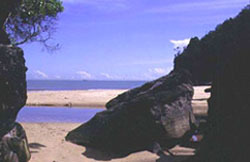 Bako National Park is truly an ideal place for nature lovers and eco-minded adventurers. The sea spray, wave action and the wind have also carved out magnificent sea arches and sea stacks at the base of the cliffs, some rearing above the waves like a mighty serpent's head. The attractive sandstone formations appear as pink and iron patterns on the cliff faces. Further inland, waterfalls tumble down into freshwater pools in a tranquil and idyllic jungle setting. There is a nominal entry fee for all National Parks in Sarawak. Photo permits are also required. Check with the National Parks and Wildlife Office in Kuching or the Sarawak Tourism Board for the latest fee structure. Day trippers to Bako can obtain a permit and pay any fees at the boat jetty in Kampung Bako. The Pitcher-plant is a carnivorous plant, a meat eater. Apparently insects, particularly certain flies, find the colours of the plant attractive.